Real-time audience feedback tools for conferences and meetings that capture important feedback and opinion, promote discussion and debate, and increase audience engagement. 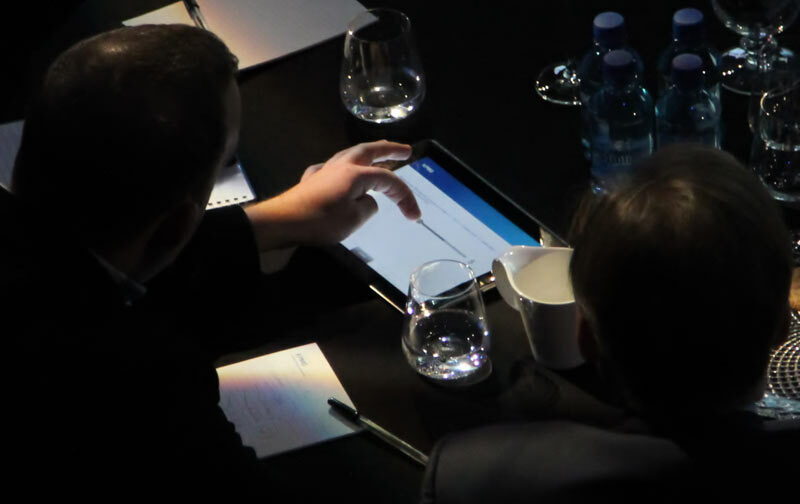 Give your conference delegates the opportunity to submit comments, questions, answers and votes in relation to the event content, themes and topics. The system can be setup so that everyone works around the same content, or so that different individuals, groups or tables can have different topics and questions sent to their devices. This enables different stakeholder groups or business departments to work around content that is more relevant to them. With content already pre-programmed into the system, our technicians then setup the devices and distribute to relevant tables, teams or individuals – the flexibility of the system means that inevitable last-minute changes can be incorporated without hassle. All of the iPad content can be remotely controlled by our onsite technicians to ensure that delegates are working on relevant content. As submissions from the iPads are received, they can be instantly viewed, edited and selected for display on main AV screens, or purely stored for post-event analysis. Additional ‘bolt-on’ functionalities can also be provided, depending on the style of the event and the type of feedback required. SMS – Providing another platform for delegates to submit their thoughts or questions for a presenting panel throughout an event. GroupDraw – Commonly used for health & safety conferences, our “virtual whiteboard” application allows delegates to annotate pre-determined backgrounds. This app also features a dedicated review device so that a facilitator can review the submissions, send them to a display screen and even edit the submissions in real-time. Registration Software – To confirm delegate attendance and input new delegate data. The Brief : To provide an interactive voting and feedback system for a series of government roadshow events. The Solution : We delivered our standard interactive iPad system to enable roadshow delegates to vote and submit feedback to a facilitating panel. Different question sets were sent to different iPads so that specific departments were able to work on content and answer questions that was more relevant to their day-to-day work. The Brief : To provide an interactive response system that allowed conference delegates to answer questions, submit comments and cast votes. The Solution : Our standard interactive iPad system was the perfect solution, as it offered all of the functionality that the client required in one simple ‘off-the-shelf’ package. The delegate responses were moderated before being sent to the main AV screens, and all responses were compiled into a simple report document for immediate post-event analysis.